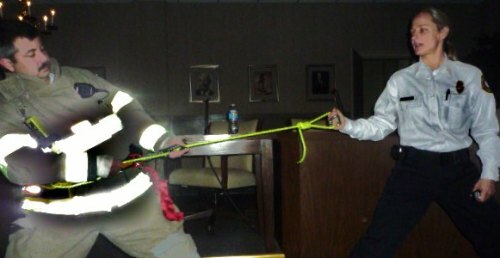 HUNTINGTON, WV (HNN) - Having made imperative choices in the stress caused by budget cuts, Huntington Fire Chief Craig Moore told the Public Safety Committee that the city has retained its Number 2 fire safety rating. When cuts were initially made, the HFD had concerns whether the safety rating might be downgraded when it came up for renewal. “We exceeded our expectations,” Chief Moore told the council Public Safety Committee Wednesday afternoon. The rating will be good for the next ten years. A one is the highest rating achievable. The rating impacts fire insurance rates as well as safety issues within the city. During the meeting, members of the Fire Department presented communications, safety and vehicular needs, as well as maintenance to aging fire stations. Capt. Jan Rader discussed “two in two out” rescue your own survival training. Rader explained that the new fire safety standards add “equipment to individual firefighters” to , for instance bail out windows or get to a safe room. As the anniversary of the tragic Emmons Junior fire that killed nine residents draws near, Capt. Rader stressed that some of the harness safety gear would have been critical in the Emmons Jr. fire, perhaps, adding time to what were two narrow escapes of two firefighters. In fact, one of the harnesses can double as a victim descending rescue device. The Public Safety Committee has approved the proposals which also include grant applications. The matter will now go before the finance committee.